One of the gates to Bear Ranch. This one is at the end of Gunnison County Road 2, with Ragged Mountain in the background. GUNNISON COUNTY — Billionaires by definition have money. But as Bill Koch is showing locals on the Western Slope, billionaires can also have hobbies on a grand scale. And the echoes of Koch’s wonderful Western world now under construction on his Bear Ranch are being heard in Delta, Gunnison and Pitkin counties. Koch’s activities in the region are centered on his latest obsession, building an “authentic” Western town in a former pasture at the base of the incredibly scenic Ragged Mountains, about 12 miles up Highway 133 from Paonia and just east of Paonia Reservoir. His luxury Western town includes a train station, a livery station, a saloon, a bunkhouse, a firehouse and two large Victorian-style homes. A view from the road on BLM property of the Western village under construction on Bear Ranch. The BLM road, which dead-ends at another Bear Ranch gate, is highly maintained and serves as a connector between the upper and lower sections of Bear Ranch. 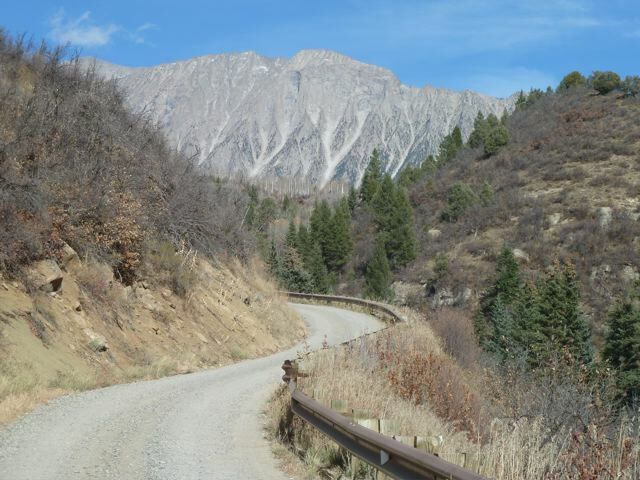 Koch has also built a new road up to the ranch from Gunnison County Road 12, which is the road over Kebler Pass. For some, such as carpenters and other building professionals eager for work, the Bear Ranch project means a good paycheck working on a big project. But for others, it means watching the exercise of political will at the expense of access to public lands. That’s especially true with Koch’s private town, which will not be open to the public. Employees have to sign confidentiality agreements. There is 24/7 surveillance on the worksite. 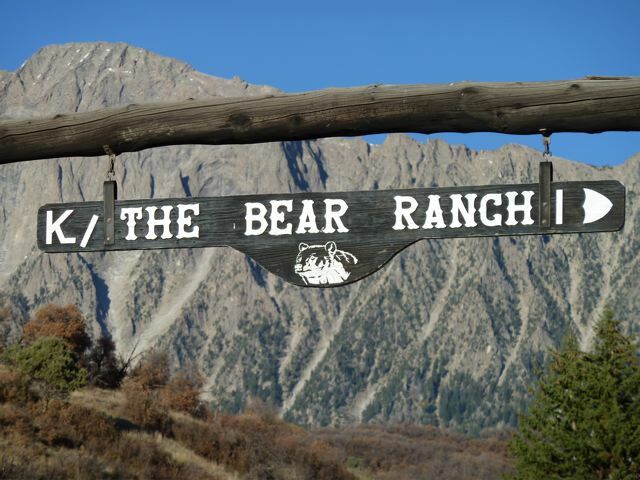 But the sprawling Bear Ranch still isn’t quite big — or private — enough for Koch, who began buying his land near the Raggeds Wilderness in 2007. He wants Gunnison County to give up a public road running through BLM land that separates his two big parcels. And he wants to trade the BLM property for land he owns elsewhere in Colorado and Utah. To make it happen, Koch recently put together a revised federal land swap proposal, which the Gunnison County commissioners unanimously agreed to and endorsed on Tuesday, Oct. 18. It was a critical step, as members of Congress rarely vote for land swaps not endorsed by local officials. Koch’s first proposed land swap was introduced in 2010 in the House by former Rep. John Salazar, D-Manassa, who quickly had it hung around his neck by opponents as being a favor for a billionaire campaign donor. Forbes magazine put Kochs’ net worth this year at $3.5 billion. His twin brother David and his older brother Charles became well-known in the last election cycle for raising big money to support conservative causes and union-busting politicians. But Bill Koch’s politics seem more pragmatic than polemical. Most of his personal contributions, and those from his private company, Oxbow, are directed at Republicans — most recently House Speaker John Boehner. But through the years, he’s also given donations to John Kerry, Hillary Clinton​ and Al Gore​. Perhaps relevant to Bear Ranch, he’s also recently given contributions to all three incumbent Delta County commissioners, Rep. Scott Tipton, R-Cortez, and Democratic Sens. Mark Udall​ and Michael Bennett. One thing that Bill, David and Charles Koch (pronounced “coke”) do have in common is a taste for luxury homes in Aspen. In 1992, Charles and David each paid about $2.5 million for nearby houses in Aspen’s lovely West End — just steps from the Music Tent. 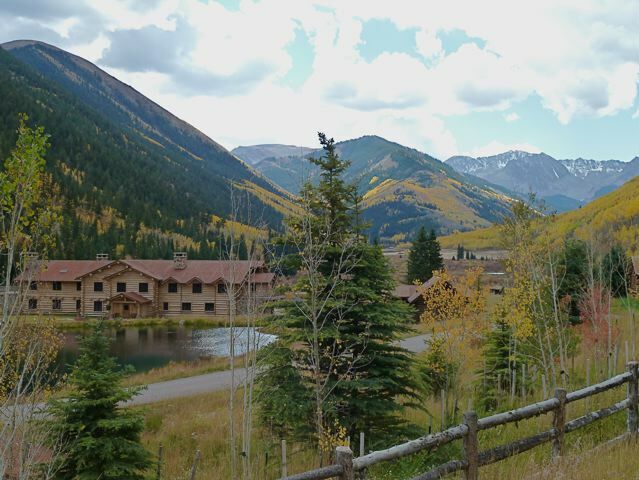 Then in 2007, Bill one-upped his brothers and spent $51 million on four properties in the upper Castle Creek valley south of Aspen, including the 17,000-square-foot Elk Mountain Lodge building near the ghost town of Ashcroft. It was here that Bill Koch’s cowboy obsession first slipped into view, as he sued his interior decorator for not making the decor in the renovated lodge quite Western enough. They later settled. During a June auction in Denver, Koch tipped his Western-obsessed hand again, paying $2.3 million at auction for the only known, authenticated photograph of outlaw Billy the Kid​. “The fact that it got that high really floored a lot of us,” said Steve Friesen, curator for the Buffalo Bill Museum​ and Grave on Lookout Mountain, who observed the bidding. Koch’s collection now fills a warehouse in Paonia. His Western town is designed to be both a showcase for valuable memorabilia — one building is designated as a museum — and a self-contained enclave with a state-approved private water treatment plant with two 60,000 gallon underground tanks. Gunnison County has issued permits for 50 buildings on Bear Ranch, two of them in excess of 11,000 square feet. Tony Prendergast watched on a balmy afternoon this summer as a deconstructed home on a flatbed truck cruised by his place in nearby Crawford. “Every once in awhile, I see a building all wrapped up, heading to the property,” Prendergast said. Some of the old wooden structures hail from the defunct Buckskin Joe attraction outside Canon City that hosted mock shootouts and hangings. Koch bought the former movie-set buildings and Royal Gorge Scenic Railroad in September 2010 for $3.1 million. One ranch laborer opined that Koch wants the public road abandoned so he can install the railway on a relatively level alignment. 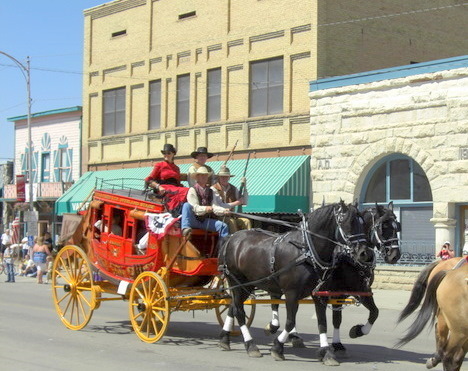 A pristine stagecoach from Bear Ranch in Paonia's Cherry Days Parade on July 4, 2011. Bill Koch is in the front seat of the stage, next to the driver, and holding a rifle. Whatever Koch’s ultimate vision is for his new town, many are just happy he has one, and is willing to spend his money to make it reality. 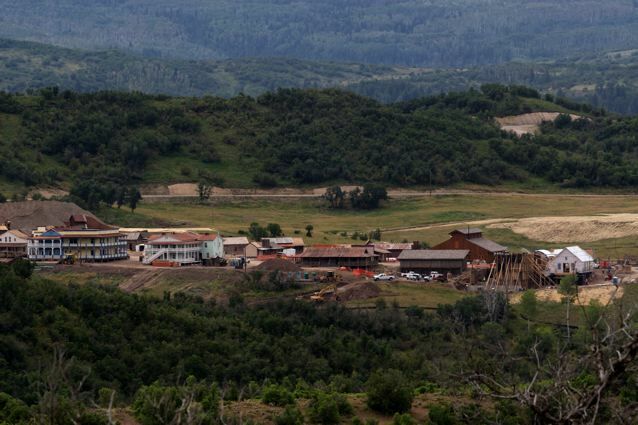 As construction activity in the Roaring Fork Valley slowed over the last three years, many tradesmen packed up their tools and joined the burgeoning staff of carpenters and electricians building Koch’s Western town. Indirect benefits from Koch’s world extend to North Fork Valley Airport manager Mike Clawson, who has been able to make improvements thanks to increased business from Koch and his Bear Ranch visitors. “He contributes a lot to the local economy,” said Clawson, who leases a hangar to Koch for his private helicopter, used for the 25-minute flight from Aspen. The billionaire boon has allowed Clawson to buy a courtesy car and add a new picnic structure for airport users. Koch’s greatest economic influence in the region, however, is via the Elk Creek Mine in nearby Somerset. The mine is part of Koch’s Oxbow group. 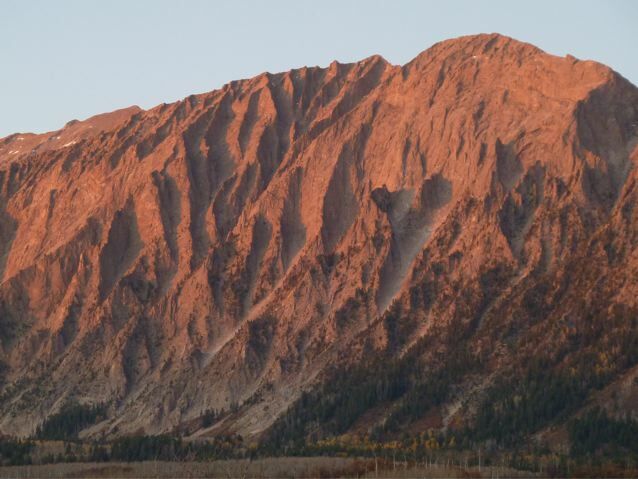 Local radio and newspaper ads trumpet that Oxbow is here “for the long haul,” and tout the mine’s financial contributions to the valley, which they say total around $90 million. 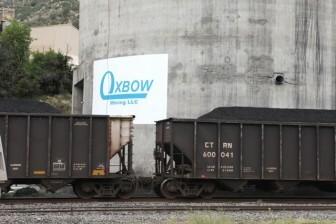 Oxbow’s coal mine in Somerset, between the road to Bear Ranch and the town of Paonia. That may be, but he needs an act of Congress before he can ride off into his own Western sunset. The first bill he spurred into Congress was called the Central Rockies Land Exchange and National Park System Enhancement Act of 2010. The bill didn’t make it out of committee before Salazar lost to Republican Scott Tipton. Koch initially proposed trading about 990 acres of land he owns on the Sapinero Mesa, near Blue Mesa Reservoir in Gunnison County, and Dinosaur National Monument, near Vernal, Utah, for the 1,800 acres of BLM land surrounding his Bear Ranch parcels, including land that provides access to the wilderness along Deep Creek. In response to critics that the acreage was two-for-one in favor of Koch and of little benefit to North Fork Valley residents, Koch is committed to buying the $3.2 million Buck Creek Ranch up the valley from Bear Ranch, and has proposed assisting in the planning and construction of several trail projects. But Deep Creek isn’t just any trail, say detractors who also worry about what they believe could be a precedent-setting decision. On the open space board, she argued against another potential public land swap near Carbondale involving billionaire retail magnate Leslie Wexner​. That deal fell apart when Pitkin County refused to endorse it. Now, Wexner is working directly with officials at BLM in an effort to remove the public land that splits his ranch. Meanwhile, just north of Bear Ranch, retired homebuilder Joe Zanin enjoys the big views of the Raggeds. He supports Koch’s land swap, and feels that neither Koch nor Wexner were given a fair shake by elected officials and the public. A Rotarian and church volunteer, Zanin doesn’t get upset about a lot these days but will speak up against what he feels is undue criticism of his neighbor. An enhanced land swap proposal by Bear Ranch, unanimously approved this week by the Gunnison County commissioners, could help landowner Bill Koch realize his dream of keeping his legacy ranch private. Koch is under contract to purchase the 811-acre Buck Creek Ranch that could provide an entry point to the Ragged Mountain Trail and may appease some opponents concerned that this backcountry gem would be rendered inaccessible by the public. Additional motorized and non-motorized trail access has been added to a package offered by the billionaire landowner that includes: 911 acres in Curecanti National Recreation Area in Gunnison County, an 80-acre inholding west of the Dinosaur National Monument Quarry Visitor Center in Utah, a 20-acre parcel adjacent to BLM lands near Paonia on Jumbo Mountain and a new trailhead to the Ragged Mountain Trail. It’s not been determined how much of Buck Creek Ranch will be available for public trail access. The exchange is being handled through federal legislation instead of the more commonly used administrative process, which involves public hearings and an environmental review that can be lengthy. 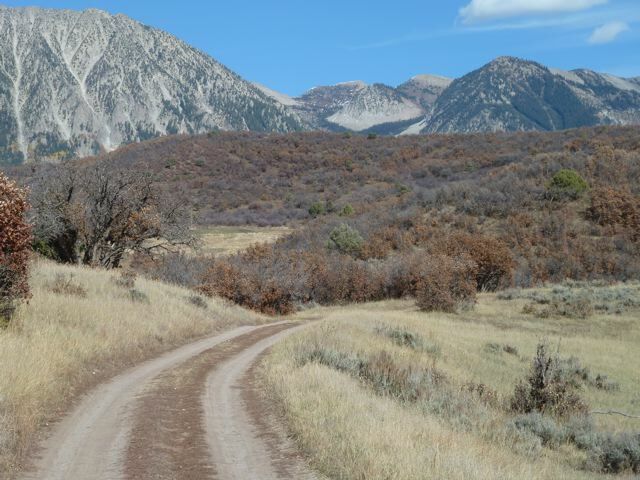 If the legislation passes, within one year Bear Ranch would be required to provide an easement across its property so a non-motorized trail between Spring Creek and Forest Service Road 795 — that could become part of the 73-mile-long Crested Butte to Carbondale trail — would be designed and developed by Bear Ranch. It would run parallel to an existing trail. In exchange, the billionaire could finally connect his two expansive Bear Ranch parcels by extinguishing public access off Gunnison County 2 and a 2-mile-long strip of land controlled by the BLM. This access cannot be closed until Koch finishes his trail work. 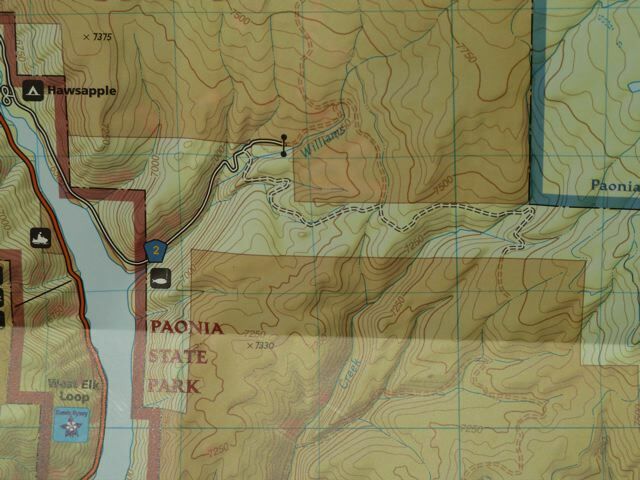 (Above is photo of a section of the National Geographic Trails Illustrated Map, “Kebler Pass, Paonia Reservoir.” It shows, with solid lines, Gunnison County Road 2 dead-ending at a gate – one of the Bear Ranch gates. It also shows, with dashed lines, a road crossing BLM land between two sections of private land. The BLM road turns sharply at the corner of Forest Service property, the border of which is shown in blue, before ending at another Bear Ranch gate. On the map, private land is shown in a darker shade than public land). Koch would receive 1,846 acres of Bureau of Land Management property plus a handful of U.S. Forest Service land contiguous to Bear Ranch. An additional trail easement off Kebler Pass​ that Bear Ranch would provide isn’t directly tied to the vacating of the road. 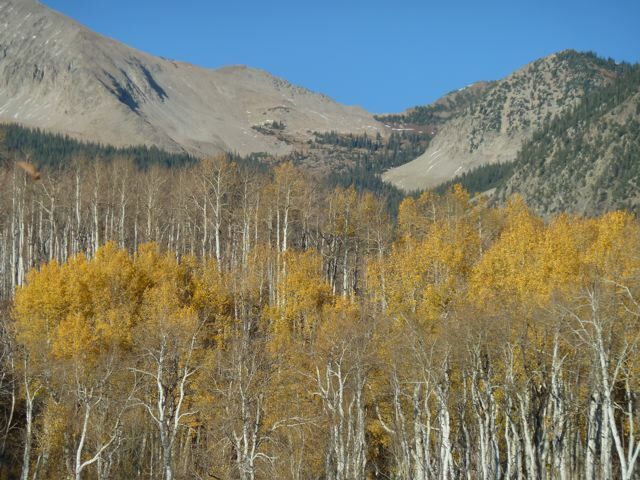 While supportive of the Bear Ranch exchange, Gunnison County commission chair Hap Channell acknowledged this week there is “flat-out opposition” by the U.S. Forest Service to one facet of the new plan. Ed Marston, a retired newspaper publisher, sees other problems with the plan that have nothing to do with parallel trails. But Bear Ranch manager Rob Gill said the Deep Creek trailhead, gateway to this BLM land, is barely used by residents of Paonia, which is on the North Fork of the Gunnison River. Bill Koch’s political contributions don’t follow a straight party line and instead appear to target candidates on a case-by-case basis. According to Open Secrets, which tracks campaign donations, most of Koch’s campaign donations from himself or through groups tied to Oxbow, are sent to Republicans. But he’s also contributed to many prominent Democrats, including $2,000 to Tom Daschle in 2004, $1,000 to Jay Rockefeller and Tom Harkin in 2002, and $1,000 to Hillary Clinton, Ted Kennedy and Al Gore in 1999. Koch, as an individual, has supported the past two Democratic governors, John Hickenlooper ($1,525) and Bill Ritter ($500). His political action committee, Oxbow Carbon Mineral Holdings, Inc. also contributed $525 to Hickenlooper’s campaign. Bill Koch and Oxbow seem particularly interested in who occupies Colorado’s 3rd Congressional District seat, which includes the Oxbow mines and the properties near Hotchkiss where future mining activity is envisioned. Republican Rep. Scott Tipton, elected in 2010, recently received a $3,500 contribution from Oxbow; his predecessor, John Salazar, was a recipient of $13,600 from Koch individually and $10,000 worth of Oxbow’s PAC funding in 2009. Salazar was a co-sponsor of the first iteration of the land swap involving Koch’s Bear Ranch. U.S. Senate candidates Mark Udall and Ken Salazar, both Democrats, received contributions of $4,600 and $2,300, respectively, from Oxbow in 2008. Salazar appears to have returned that money (the 2010 cycle shows a -$2,300 from Oxbow). Senator Michael Bennet (D-CO) received a $2,500 contribution from Oxbow last year. In the state Senate race, Ellen Roberts, a Republican representing District 6’s slice of southwestern Colorado, received $400 in the 2010 election cycle. In District 5, the Oxbow PAC donated $400 to Republican Bob Rankin’s unsuccessful bid to unseat Democrat Gail Schwartz, whose district includes Oxbow’s Elk Creek Mine in Somerset. All three Delta County commissioners, Republicans Douglas Atchley, Olen Lund and Bruce Hovde have received contributions ranging from $500 to $1,500 from either the Oxbow PAC or or Oxbow Mining LLC. However, neither Koch nor Oxbow have contributed to the campaigns of the three seated Gunnison County commissioners. Oxbow Mining LLC contributed $200 to the Committee to Elect Kathleen Curry, a former Democrat who ran unaffiliated and was unsuccessful in the 2010 state House race for the 61st District (whose district includes Koch’s Aspen residence). Republican state Representative Don Coram, from District 58 (which includes Paonia) and Randy Baumgardner of District 57, which includes much of northwest Colorado including the mining-rich Piceance Basin, received $500 each from Oxbow Mining LLC. Walker Stapleton, the state’s treasurer representing the Grand Old Party, received $1,050 from the Oxbow PAC in 2009. Editor’s Note: A version of this story was also published in the Perspectives section of the Denver Post. Also, below is an interview with reporter Madeleine Osberger from the public affairs program “Aspen Journalism On-Air,” a public affairs show on KDNK, Carbondale Community Access Radio. The interview, which took place on Tuesday Oct. 25, 2011, live in the KDNK studios, is about 25 minutes long.